I've mentioned previously how I believe that once we start visualising the things we want in life coincidence or synchronicity often follows. So today I though I'd write a little about Seed Money. This is where it's possible to 'plant' money and watch it grow. Firstly, Seed Money isn't anything to do with tithing. To tithe is to give one-tenth of an income to a church, charity or some good cause - this is giving, therefore, after we have received. Seed money is the other way round. Giving first and then receiving a ten fold return - some successful practitioners call it the Law of Tenfold Return. 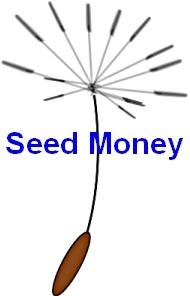 Over the years I've experimented with Seed Money and generally speaking it works. If you haven't heard of this process previously it's simplicity itself. You give an amount of money to an organisation or charity that you feel needs the cash. Or it can be to a needy individual or family. You give the money with the full belief that it will return to you tenfold i.e. give £10 or $10 and receive back £100 or $100. This is the full procedure. Give, and it shall be given unto you; good measure, pressed down, and shaken together, and running over ...(1) Plant your Seed Money - by giving it freely, without fear to the person or organisation you choose. (2) Cultivate your Seed Money by claiming your return. Use your own phrase, something you feel comfortable with, but along the lines of: "I have received £/$ ...... (ten times the amount given) in return, to the good of all concerned. Thank you, thank you, thank you." (3) Repeat the phrase over and over during the day and especially last thing at night and first thing in the morning. And that's it. You simply believe that the money claimed is already yours. How the money will actually arrive isn't your problem, just trust that it will. Perhaps a coincidence will happen, maybe you'll get a completely unexpected bonus from your employer, you might win a prize, who knows ... but it will come about. If you haven't planted Seed Money previously I would suggest you start small. Perhaps a few pounds or dollars that won't affect your budget. Working this way is a bit like developing your muscles, do it gradually. Confidence and belief will build until you know 100% that it will work. You can then start lifting those heavier weights or demonstrating larger amounts of money. Seed Money may sound crazy to some readers but whatever we give out we get back - be that good things or bad. The truth is, we could just ask and visualise the amount of money we want without giving first - but Seed Money makes the whole process easier and more believable. Plus someone or some organisation will benefit too, which can't be bad. I'm going to try this. Have a friend in mind. This is one of those practical activities I so love! Will report back. Thanks for sharing this, Mike. And thank you for putting up our cover! Suzie: Mmmmm, that's the sort of thing you would suggest! Trish and Rob: Would love to hear how well you do. Good luck. This works more effective if you cultivate your sexual energy.